Stay Silent is the second book in Clockwise Press’s Arrivals, a series of narrative non-fiction that share the stories of immigrants and refugees. Author Natalie Hyde tells the story of Paola Gomez, a woman from Quimbaya, Colombia. Raised by a terribly controlling and abusive father, Gomez went on to attend law school at the age of 17. While there, she started a shelter for women and children. At the time, the police and paid death squads in Colombia were killing people deemed “disposables” – often prostitutes and street kids. One of those killed was a boy from Gomez’s shelter. She was forced to leave her home country after she was beaten unconscious for exposing his murderers. She fled first to the U.S. and then to Canada, where she was granted refugee status. Gomez now helps run Sick Muse Art Projects, a community arts organization she co-founded, and is the recipient of a number of awards for her work. Hyde does the story justice. The writing is engaging, the chapters are short, and the details (both big and small) help bring readers into Gomez’s world and create a greater understanding of what life is like for newcomers, particularly refugees. 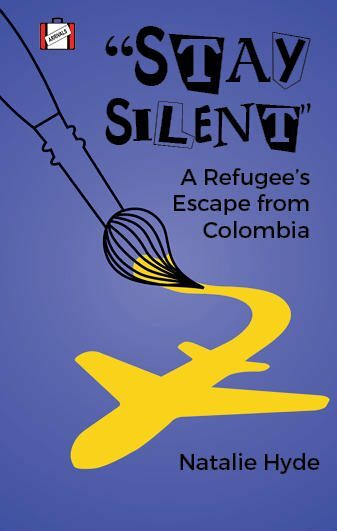 The book includes a foreword from Gomez, as well as a timeline of events, resources about Gomez and her projects, life in Colombia, and ways to help refugees and homeless youth. The book also uses a dyslexic-friendly font in an effort to be more inclusive and to reach a wider audience. Hyde could have made clearer why the killings in Colombia, or “cleanses” as they are called, were happening in the first place, but otherwise, this book is essential for kids in a time of increased need for understanding of others.